EKG or Telemetry- what’s the difference anyway? Sometimes we hear the terms EKG and cardiac telemetry used interchangeably, but they can actually be very different. 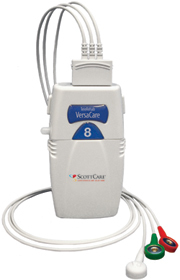 Cardiac telemetry, what most nurses and monitor technicians use in the hospital setting to monitor their cardiac patients, is a remote-type of monitoring. Patients requiring cardiac telemetry monitoring are usually admitted to the hospital for some kind of cardiac issue or are admitted for a different issue but have a history of some kind of cardiac disease. They are usually hooked up to three to five electrodes wired to a small, portable battery pack or to a cardiac monitor in the case of the intensive care unit. 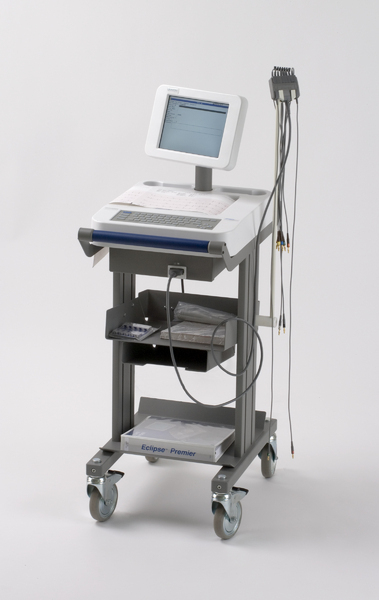 The cardiac electrical activity is then transmitted remotely to a central monitoring station – in most cases a nurses’ station or monitor room with a monitor technician. Patients can be monitored for a few hours or for their entire hospital stay. Cardiac telemetry’s purpose is to monitor heart rhythm changes or a patient’s cardiac electrical activity over a period of time. 1) In an emergent situation for a patient having respiratory or cardiac signs and symptoms such as chest pain or sudden onset shortness of breath to determine if any heart damage is taking place and, if so, where part of the heart is being damaged. 2) Sometimes physicians order EKG’s to be done as a one-time thing when the patient first comes to the hospital to diagnose any current cardiac issues or to get a baseline EKG to compare to in case the patient runs into problems or has issues later on. For an EKG, the patient lays flat, six electrodes are placed on their chest, one on each arm, and one on each leg. The patient lays still while the EKG reads the patient’s heart rhythm for a few seconds. The EKG machine then prints out a reading for the physician to read and interpret. EKG’s and cardiac telemetry also differs in how many leads they use to look at the heart. Think of leads like cameras or camera angles. Each lead is a different camera angle taking a picture of the heart. EKG’s can usually look at twelve different angles of the heart while cardiac telemetry can usually only see five leads with only two visible on the monitor at one time. However, remember that an EKG is just a snapshot, where as telemetry is monitored over a longer period of time. Try comparing it to your camera: it’s like taking a single snapshot of something from twelve different angles all at once or taking video of that same thing from five different angles over a 24-hour period.